You may remember last month I told you about the new campaign from Simply Beef & Lamb to encourage more people to cook simple, peasant meals. 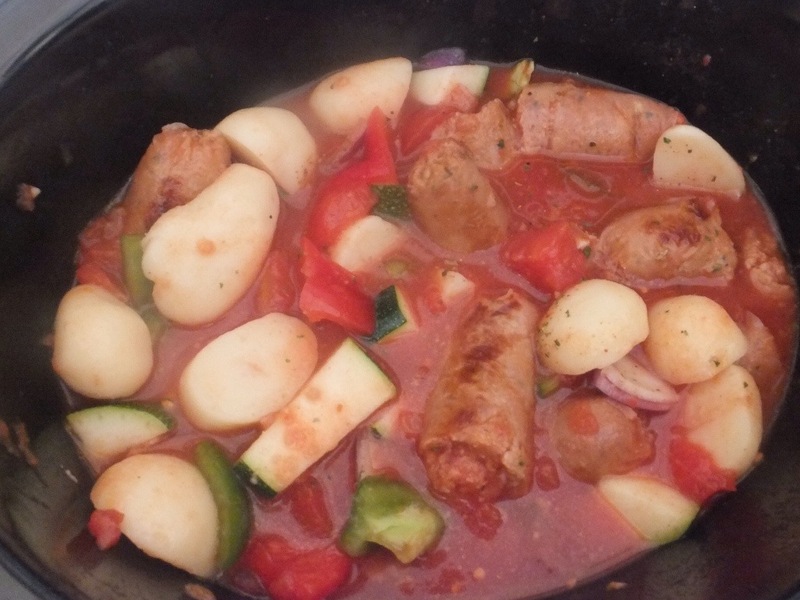 Typically low cost and cooked in one pot. 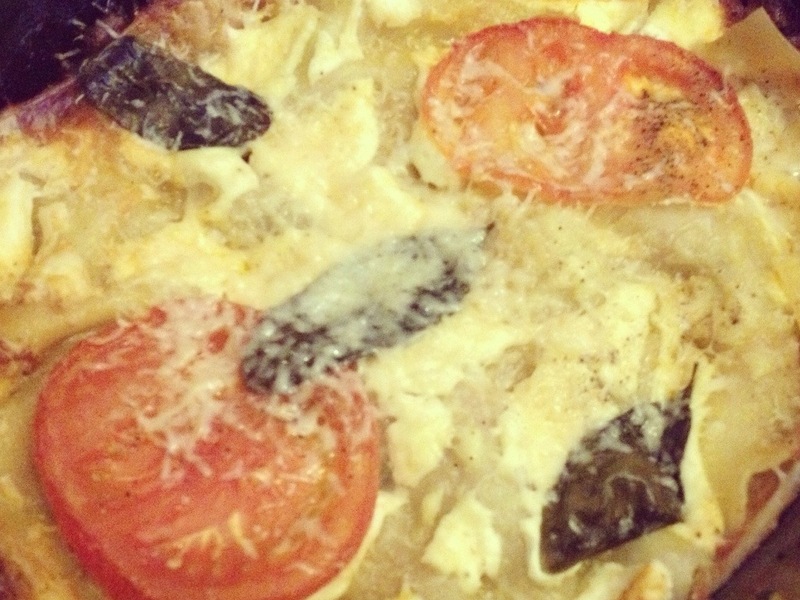 Here is a collection of recipes from my fellow bloggers created for this campaign. 4. 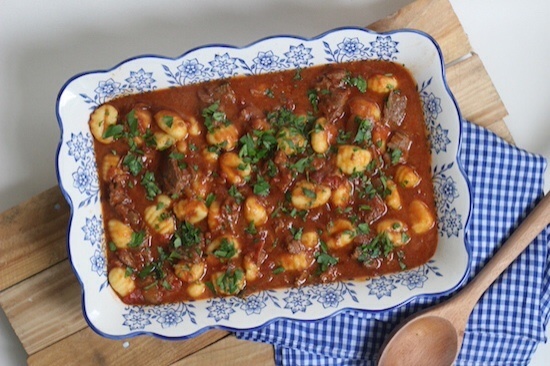 Slow Cooked Beef with Gnocchi from Recipes and Reviews. * I collaborated with Simply Beef & Lamb on this campaign and was compensated for my time. 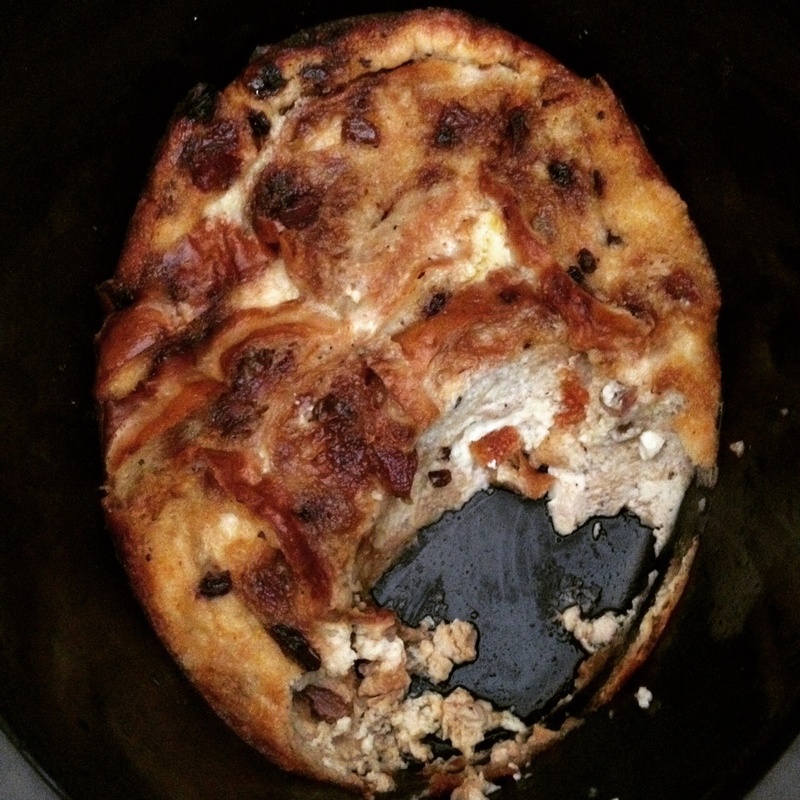 I wasn’t planning to write a blog post today but I whipped up this easy Hot Cross Bun pudding this morning and it was so good I thought I just had to share especially at this time of year when most houses have a pack or two lying about. This recipe is made using your slow cooker and it’s so simple to prepare (10 minutes max) and then you leave it untouched in the slow cooker for 2.5 hours. 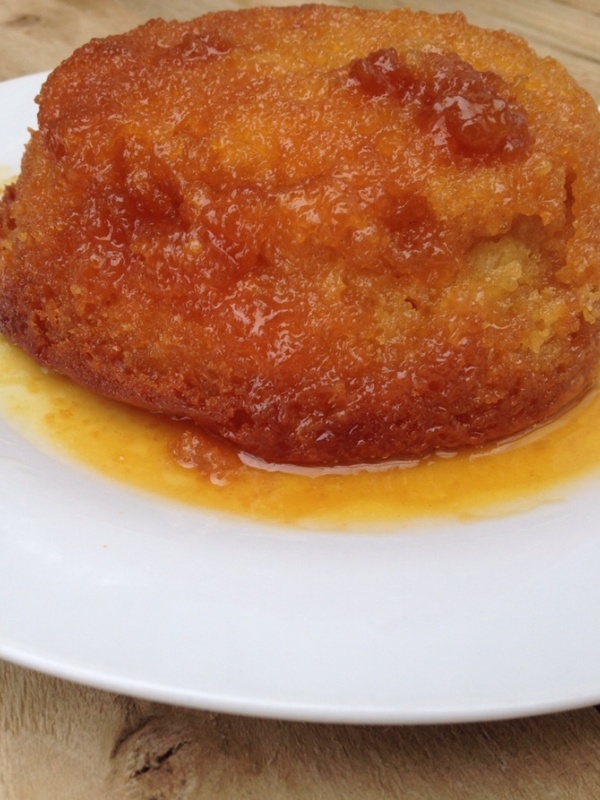 And voila you have a gorgeous, warm pudding to serve after your Easter Sunday roast…or your midday snack today like me. 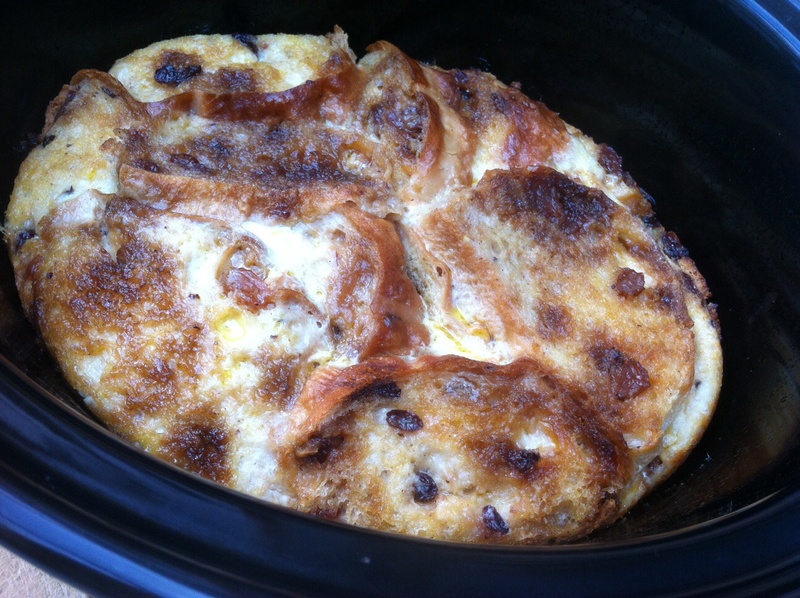 Arrange your hot cross buns slices in your slow cooker. Depending on what size/shape you have you made need to layer them creatively 😉 Now in a jug beat together your eggs, milk, cream, nutmeg and vanilla – ( this is your custard ) and pour over your hot cross bun slices. 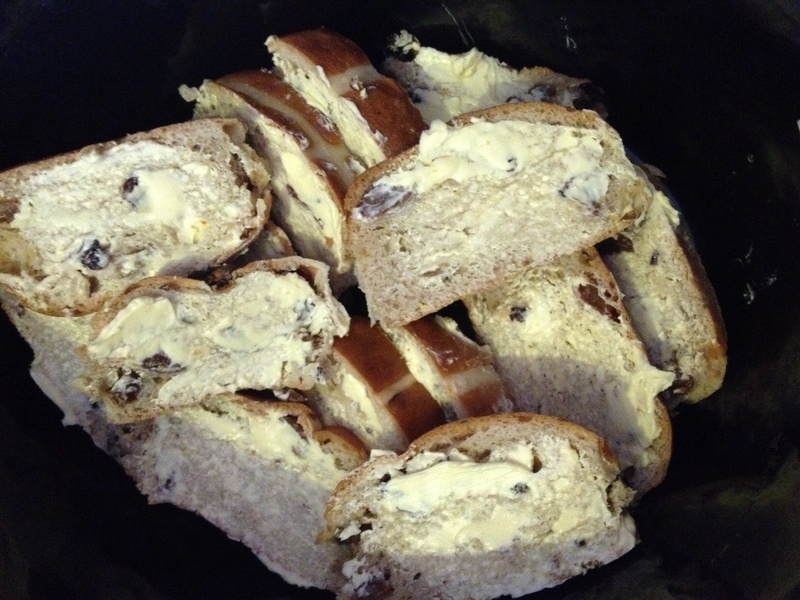 Sprinkle over your brown sugar, some should go into the custard and some can stay on top of the hot cross buns. Now place a tea towel under your slow cooker lid – I secure mine around the handle with a bobble and cook on high for 2.5 hours. At this point remove the lid and use a skewer or knife to check it’s thoroughly cooked – it should be moist but the knife should come away cleanly. 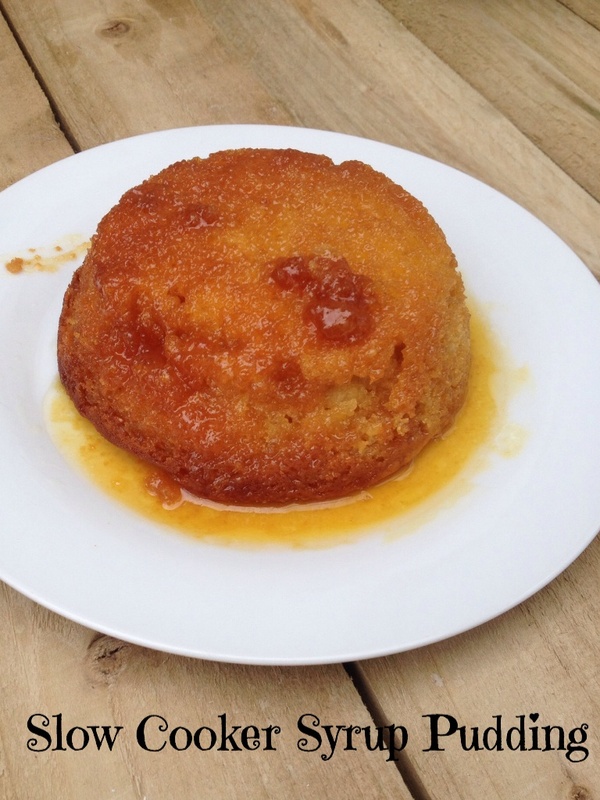 You could serve this with cream but it’s perfect just on its own. 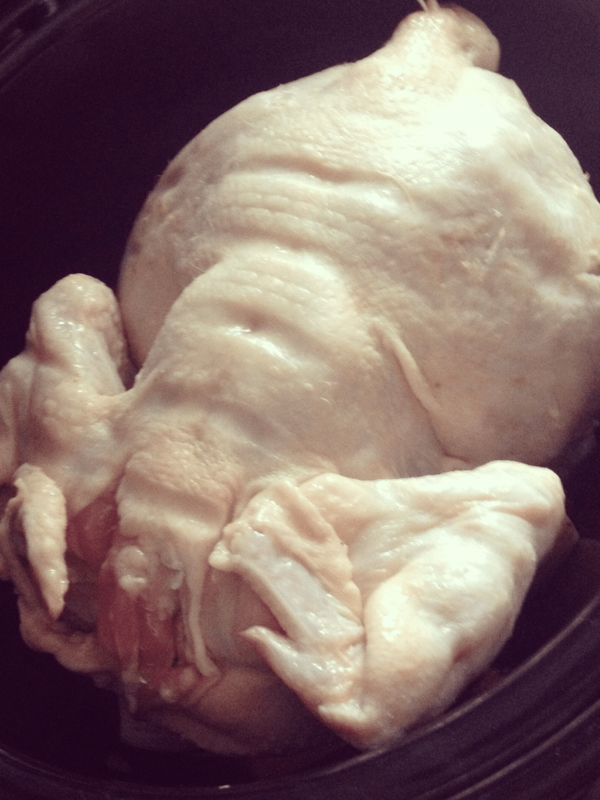 You may remember that a few weeks ago I posted a recipe – well less of a recipe and more of a how to on how to cook a whole chicken in the slow cooker. You can find that post here. As I’ve said before it’s not as golden and gorgeous to look at as a typical roast but the flavour and succulent meat is worth it. 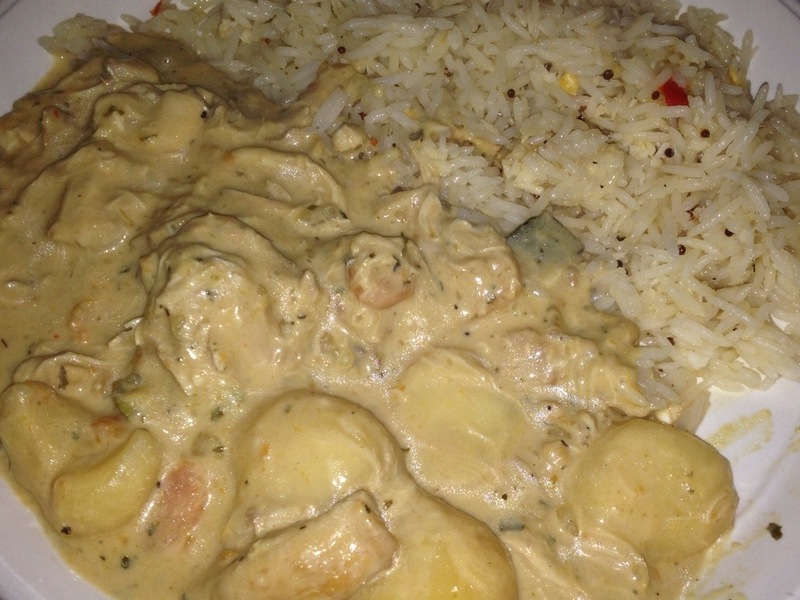 We enjoyed it so much that we have since made it several times and we manage to make about 3 meals out of it. 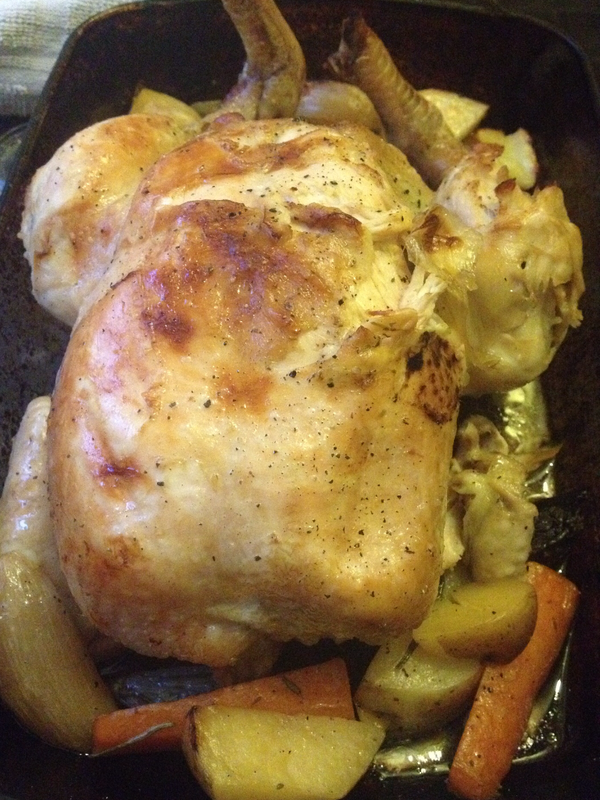 Last night I slow cooked a medium whole chicken following pretty much the same guide as in my last blog post but adding sweet potatoes and long strips of celery and I didn’t add any olive oil – purely because I didn’t want an oily stock. I also forgot to add any herbs which hasn’t affected the recipe I’m about to share. So I cooked the chicken for 5 hours on high then removed it and left the veg/juices/stock of which there were a lot to cool. Once cooled I placed in the fridge and this morning I skimmed off the fat. 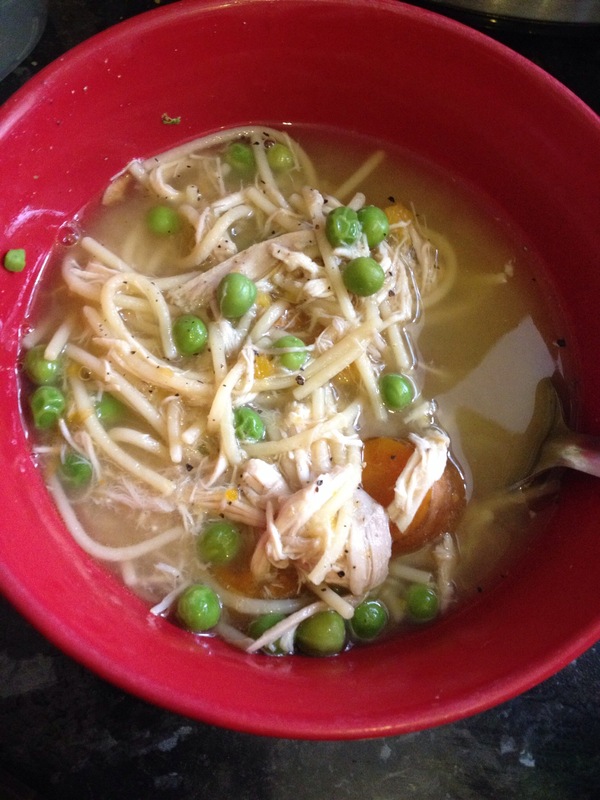 I then returned the stock/veg to the slow cooker ( minus the celery which I love but my kids find a little stringy) along with 150ml ( approx) water, about 1/3 of the roast chicken which I had stripped and shredded the night before and the frozen peas/black pepper. I turned on low and cooked for about 4 hours. For the last 20 mins or so I turned up to high and added my dried spaghetti pieces. You could use fresh egg noodles which won’t require as much time. 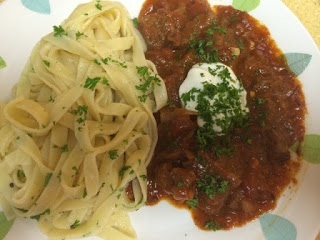 Check that the pasta is cooked and serve immediately. It’s comfort in a bowl. It’s hard to find a broth which tastes that good. It served two hungry adults for lunch, toddler and a weaning baby as well as a big tub for lunch tomorrow. 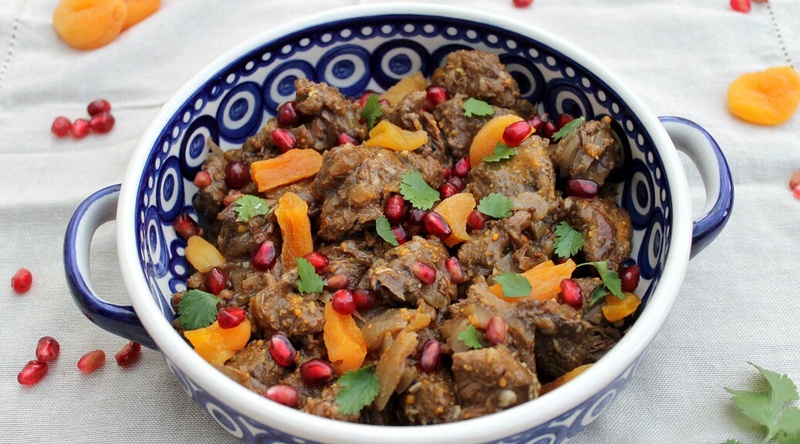 I was very much a believer that Slow Cookers were just for casseroles, stews and curries until a few months ago. 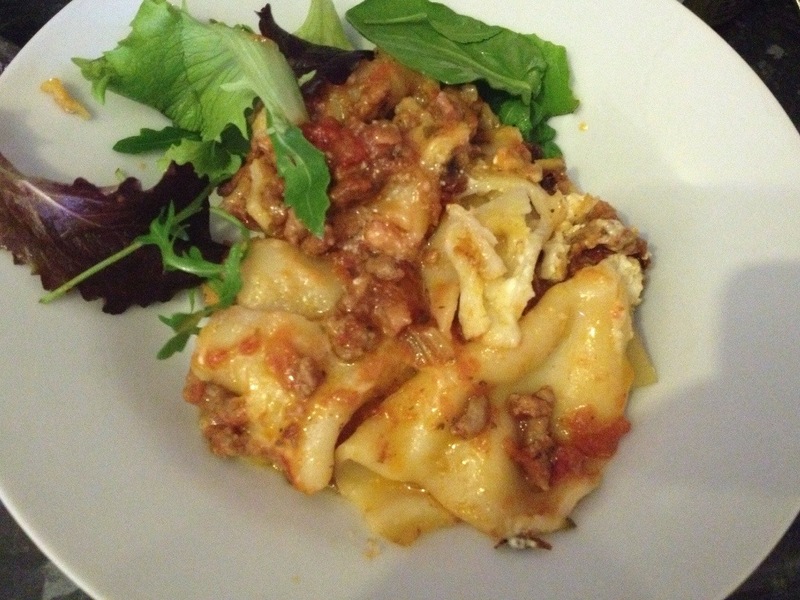 I made lasagne in mine and realised it can be adapted for most things. I’ve tried joints of meat, pulled pork and various other dishes. 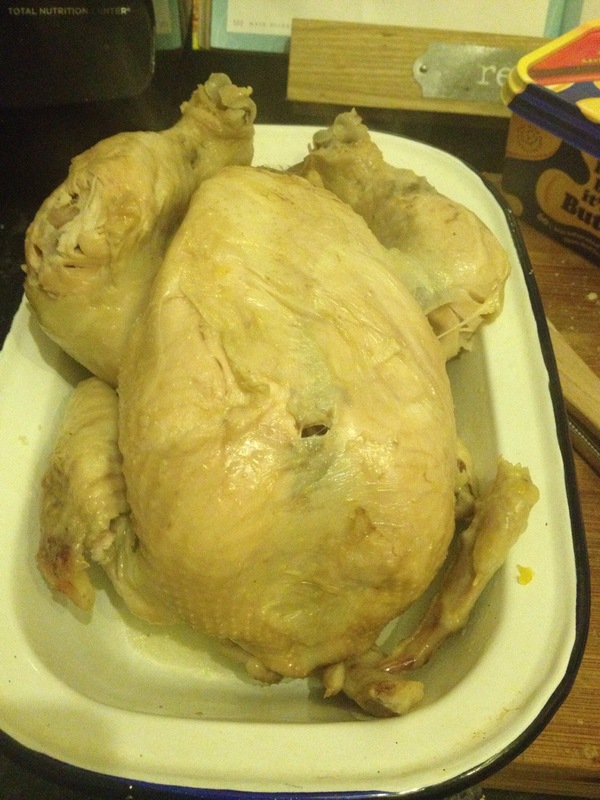 Last night I made the most beautiful whole chicken so I thought I would share with you how I did it. Turn your slow cooker on high. 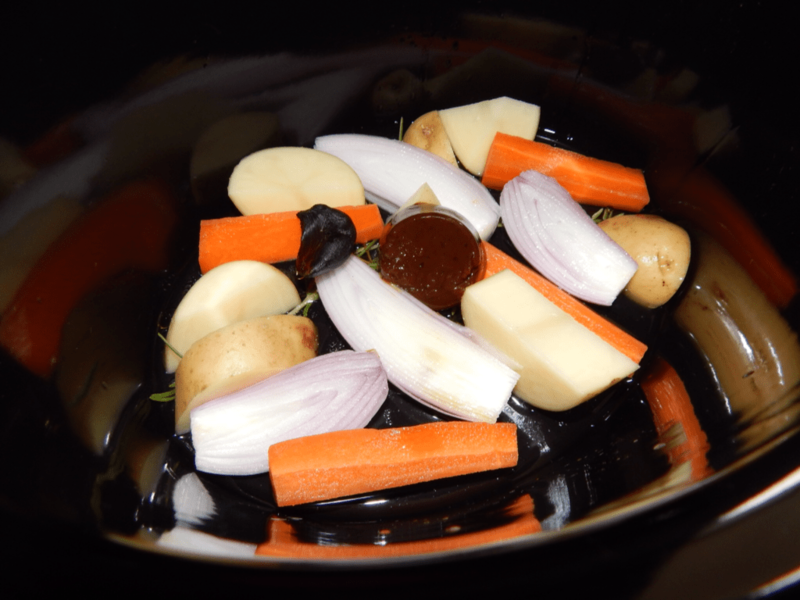 Place the oil, herbs, garlic and veg in the bottom of slow cooker. Now add your stock cube and water. Prepare your chicken by placing 1/2 a lemon in the cavity and sprinkling a little black pepper over it and place breast down on top of your veg. 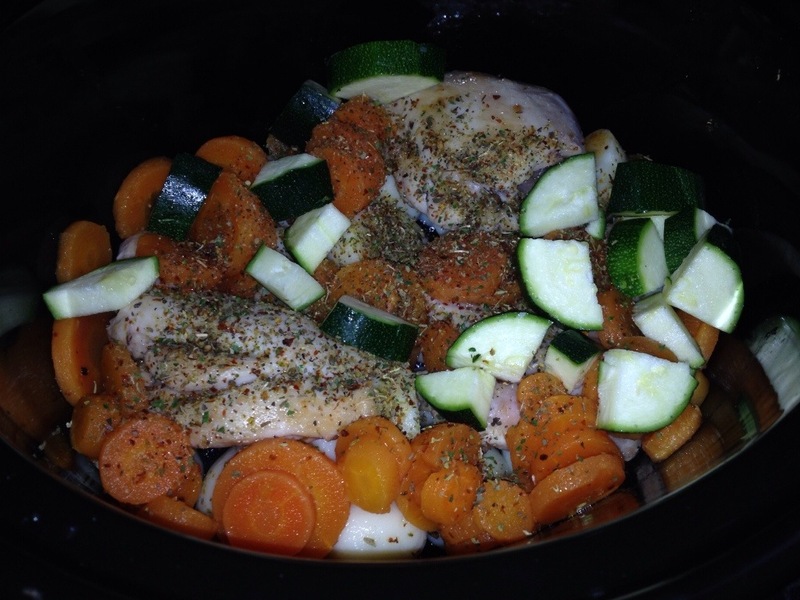 Put the lid on and leave for about 4 & 1/2 – 5 &1/2 hours depending on your slow cooker. 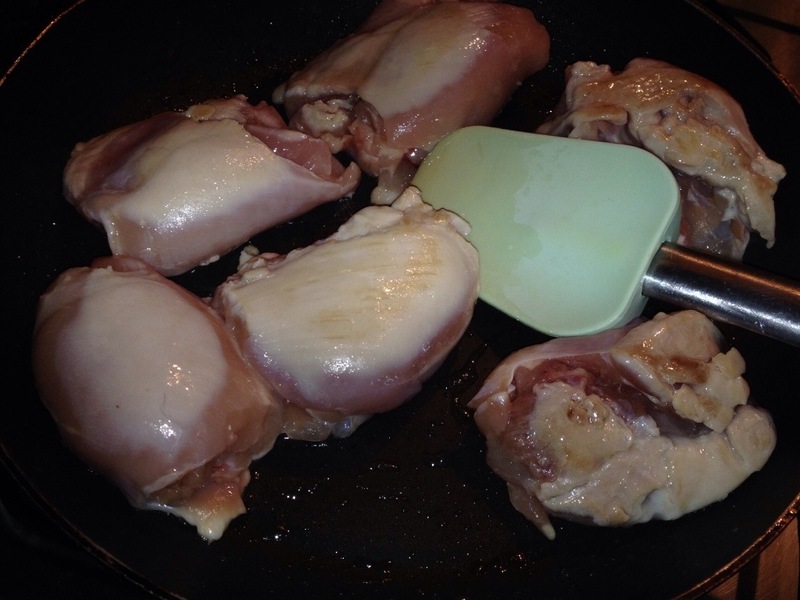 Check that your chicken is cooked. I used a meat probe just to be sure. Preheat your oven to the highest setting and then pop into a baking dish with all of your veg leaving the herbs and stock in the slow cooker. Cook for about 15 minutes until your chicken looks as good as it smells. Pull out and rest for at least 10 minutes. 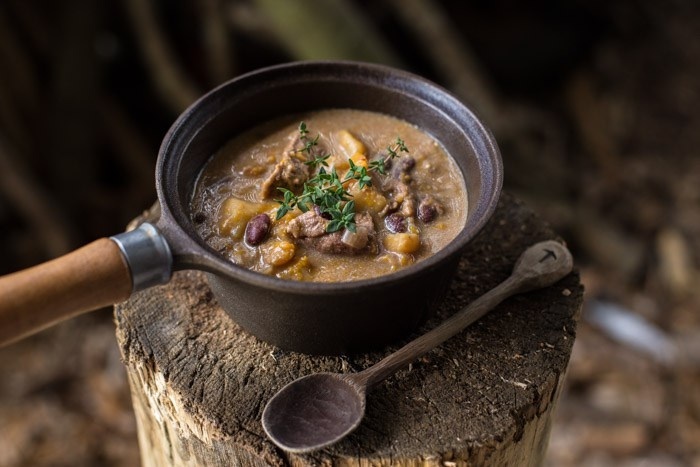 Now take your stock out of the slow cooker using a sieve and pouring into a jug or bowl. 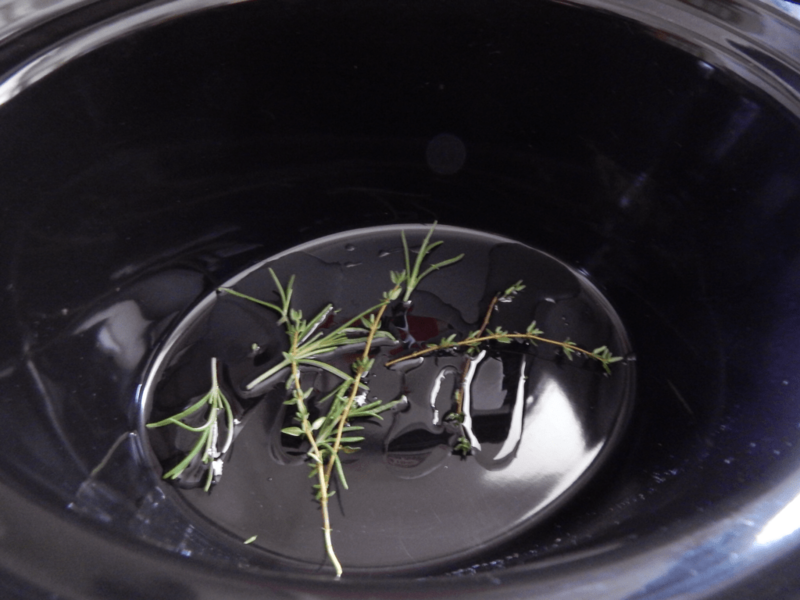 Discard your herbs and let stock cool to room temp before putting in the fridge or freezer. You could use your stock immediately to make gravy if you wanted but I fancied my chicken with sautéed potatoes and asparagus instead of in a traditional dinner so I’m planning to use my stock for another meal. I’m feeling a little addicted to slow cooking at the moment so expect lots more recipes over the coming months. 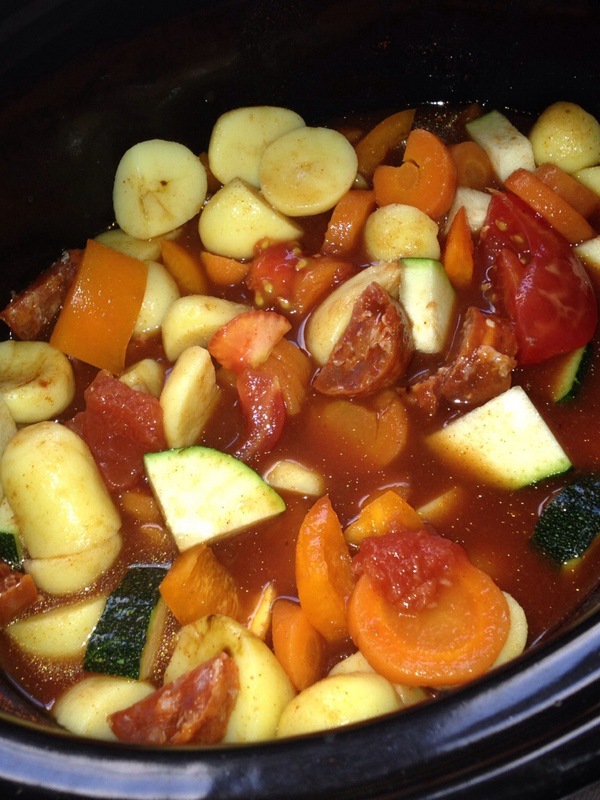 As soon as a chill is in the air I turn to my slow cooker. It’s a bit of a seasonal thing for me although it does make occasional summer outings. 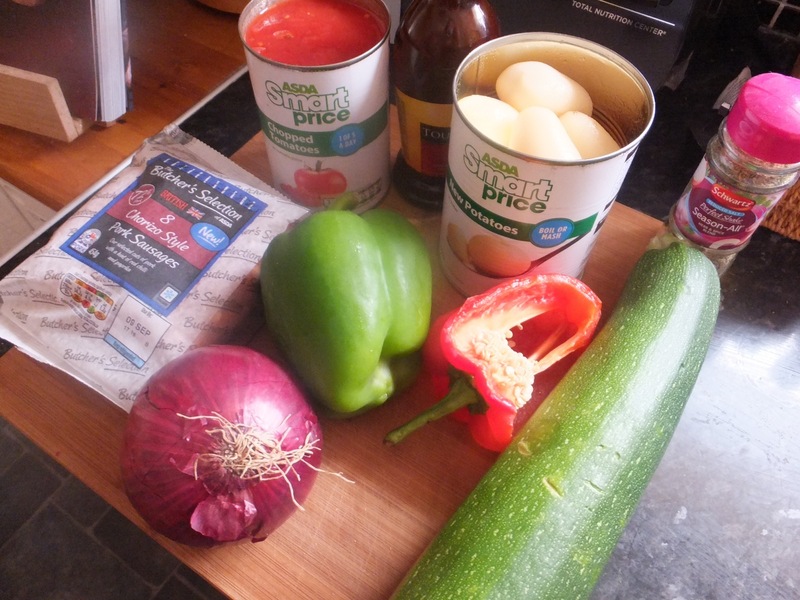 Today we were headed out for the day and so I whipped out my trusted friend to make a Spanish style stew. Put all ingredients aside from the orzo in your slow cooker. I cooked on high for 3hrs and on low for an additional 5 ( purely as I was going out and didn’t want it to overcook ) In the last 45 minutes cook your orzo to packet instructions ( usually 8 minutes), drain and add to your stew. 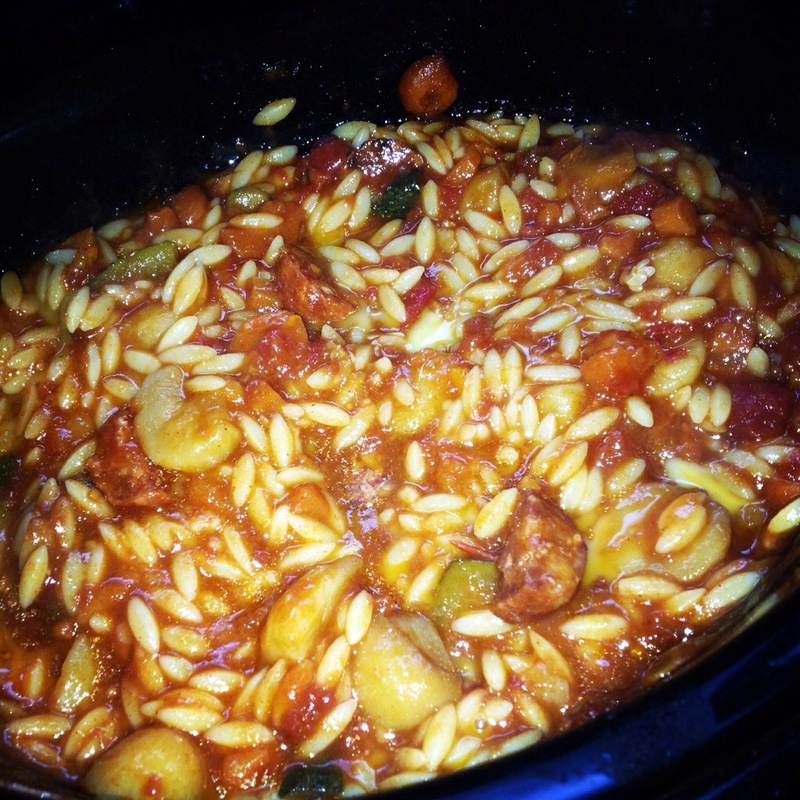 You could just add to stew earlier on uncooked and add more liquid but I didn’t plan the orzo – it was a bit of a whim. Take the lid off your SC for the last half hour as it helps to thicken the dish. Enjoy with hunks of buttered bread. Delightful. Warming. We all LOVED this dish including my 3yr old. Would serve 5-6 people. I use my slow cooker a lot but typically for the same recipes over and over again like beef stew, spag bol and coq au vin. I had a little think a few days ago about how really it can be used for at least 50% of the meals I cook and it frees up my hands and time for the little ones. 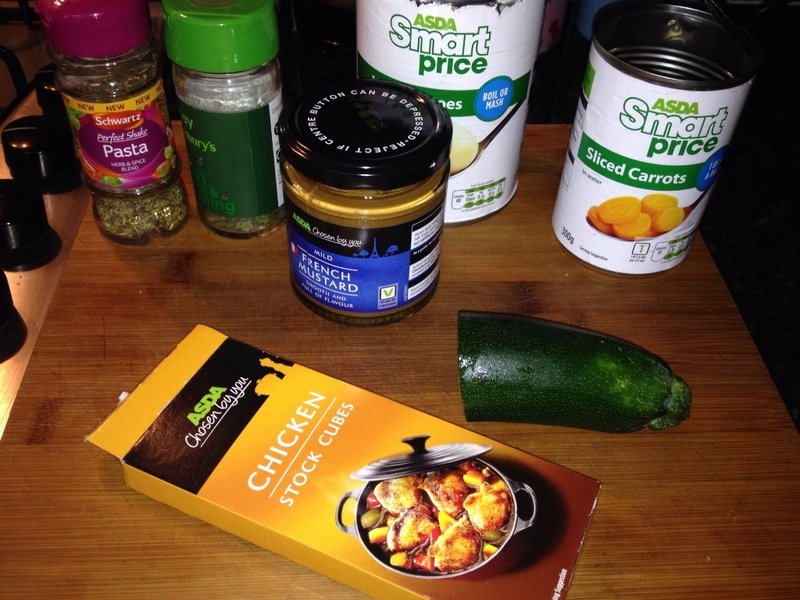 So this mustard chicken and veg came about. It’s more of a summery meal than a stew or casserole. I’ve made creamy mustard chicken on the hob before now and I was also inspired by a recipe for mustard chicken in the Jack Monroe book and so I kind of threw it all together and hoped for the best. You will see that again I’m using tinned potatoes and carrots, I do this as its far better for my budget and also easier with preparation. 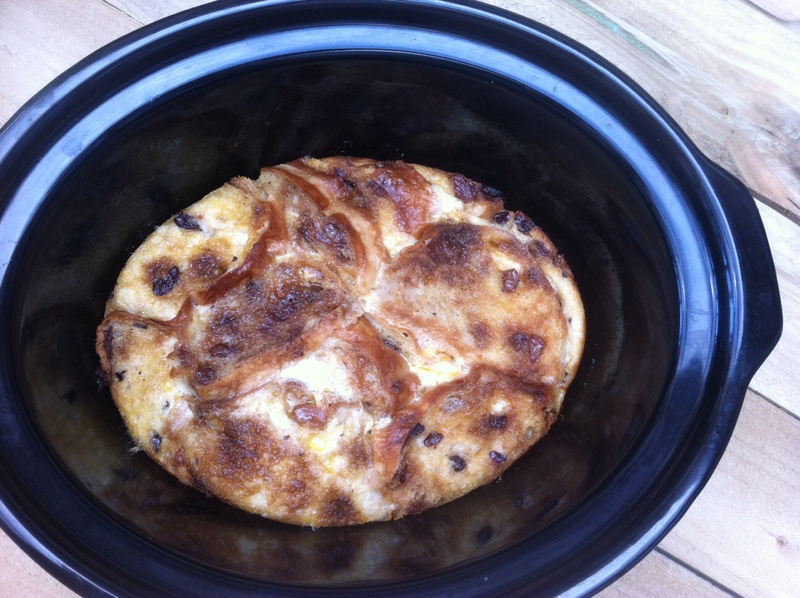 I’ve used tinned potatoes for years now in dishes such as this – I do use fresh for some meals. I love that with the popularity of blogs like A Girl Called Jack more people are realising how much easier and of course cheaper they are. It worked so well. We all cleared our plates including Izzy who I’m starting to realise loves dishes like this. Roll your thighs in the flour. 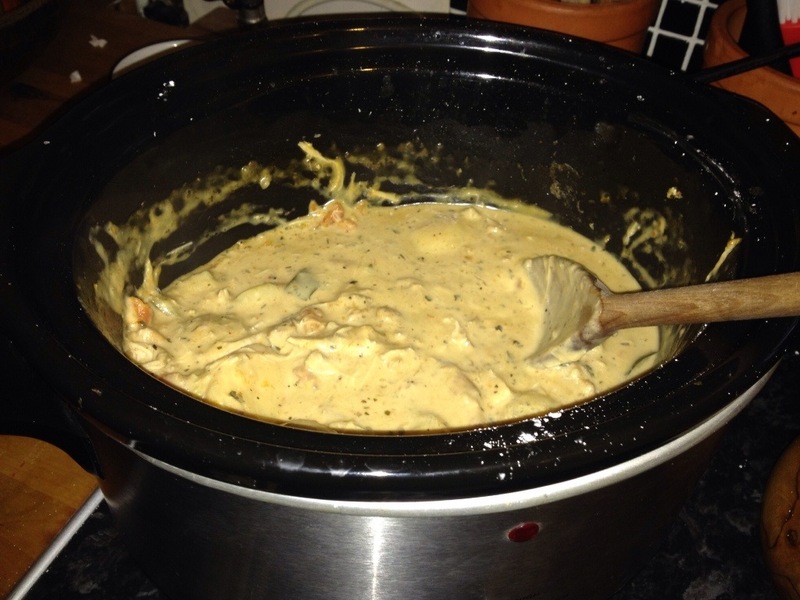 Add to the slow cooker along with all ingredients apart from cream. 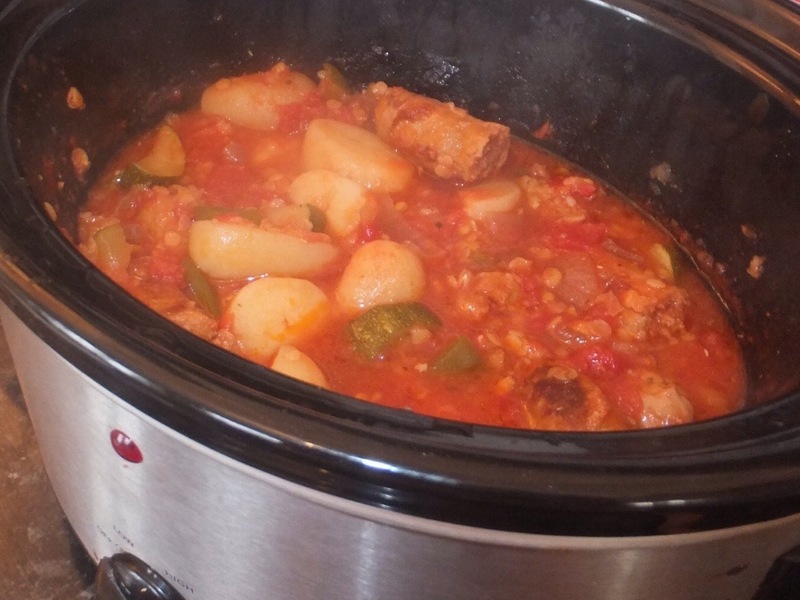 Turn your slow cooker on high for 5 hours. After 5 hours use a fork to shred your chicken in the pot and stir in your cream (add a little more flour if needed to thicken). 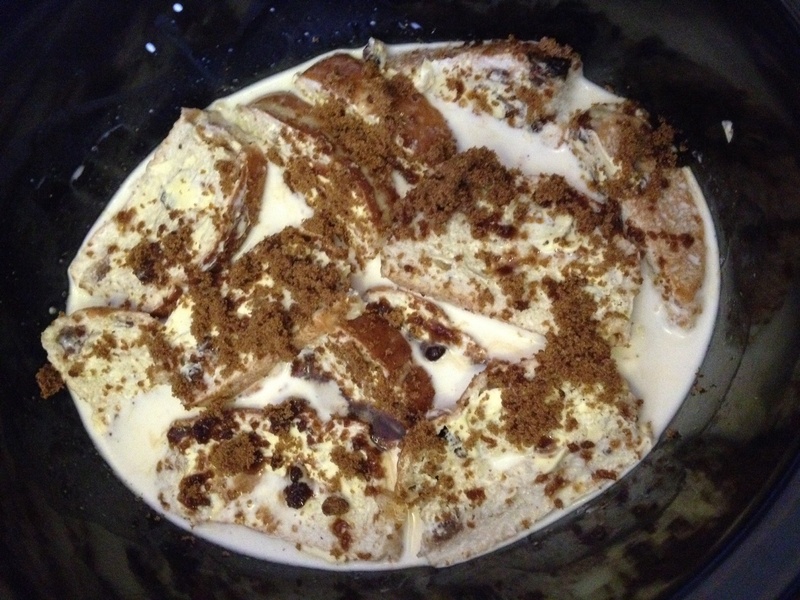 If watching the calories it would be fine with just 50ml of cream or even none at all – just not as good. Serve with rice or just hunks of bread. This fed two hungry adults and one greedy toddler with leftovers. It’s also very purse friendly with the ingredients coming in at less than £4. 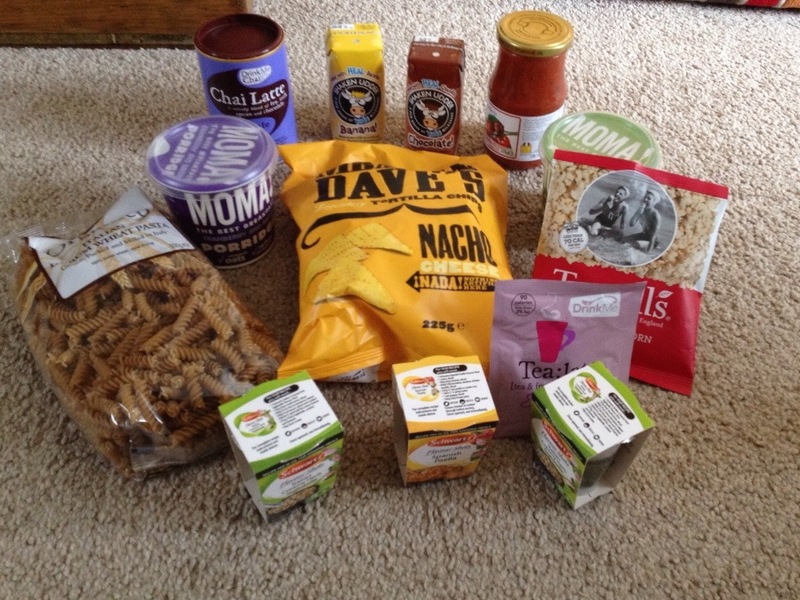 I was quite excited to be given the chance to review this food parcel delivery service from Degustabox. 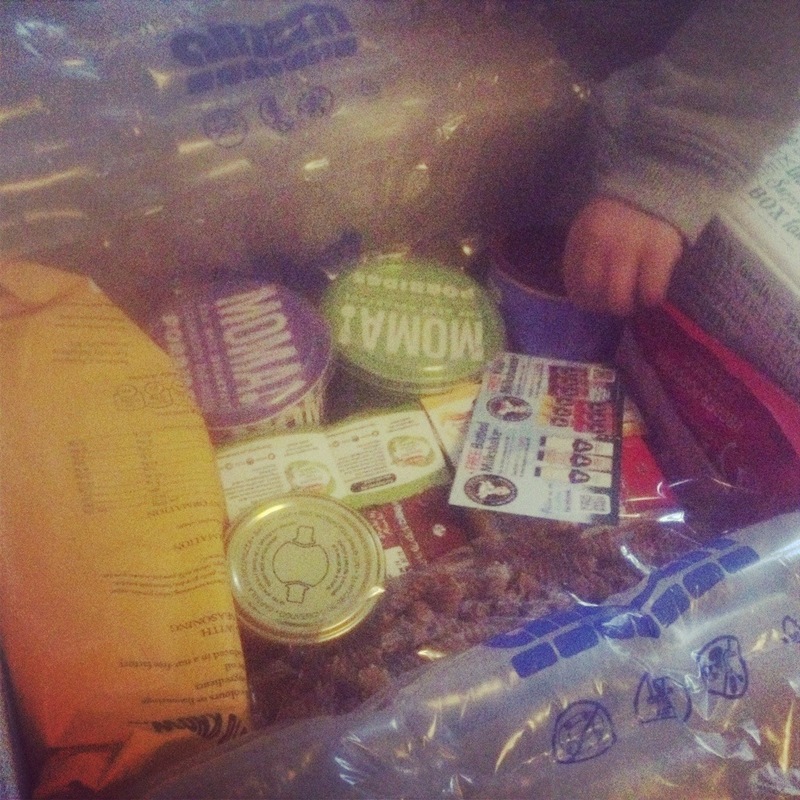 A parcel of unknown food products arriving on my doorstep each month – YES please. I wasn’t sure what to expect and I deliberately didn’t look at other reviews as I wanted a surprise. Well I was more than happy with my first box. It arrives well packaged and by a courier who lets you know approximately what time of day it will arrive – which I love. Schwartz Flavour Shots in Spanish Paella and Italian Tagliatelle. It was great seeing Schwartz products in the box as they are so reliable for great tasting products. I’m yet to try the paella but the tagliatelle is superb. Drink me Chai I must be the only person in the world that hasn’t yet tried tried a chai latte but I’m really looking forward to sampling these. I especially love that its 99% caffeine free as I don’t have much caffeine anymore. We received a 250g tub of chai latte and a sachet of the earl grey. Moma Porridge Pots In Cranberry And Raisin and Plain – No Added Sugar varieties. I’m keeping these for our first camping trip of the year as I think they will make ideal breakfasts as they only need hot water to mix them up. Izzy loves porridge so a great way to keep her healthy eating habits up on hols. Tyrrell’s Proper Popcorn In sweet n salty flavour. I love anything sweet and salty especially snacks such as popcorn. These are really tasty and it was nice to try a new brand out as I’d seen these before but never tried. 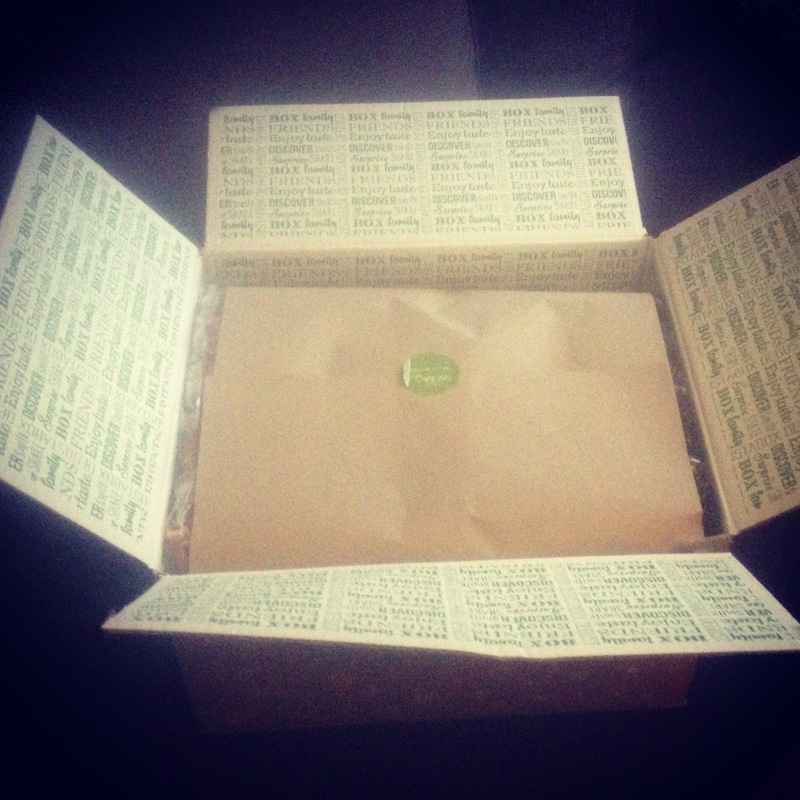 This is what is great about the Degustabox – trying out new products you may not have otherwise. Organico Italian Durum Wheat Pasta 500g bag of brown penne. I like different types of pasta and I tend to use wholemeal pasta when I make a pesto pasta salad so I will let you know what I think when I make that. Mexican Dave’s Nachos Cheese Flavour. These are really good Nachos. We initially planned on making a tortilla dish in the oven with them but ended up munching them dipped in sour cream whilst enjoying a film. Yum. Organico Tomato and Basil Sauce Another Organico product which we have already used and loved. This is a product you can feel good about feeding to your family. Straightforward natural ingredients including tomatoes, olive oil and basil with no nasty colourings or preservatives. I’ve used this in my recipe for slow cooked lasagne below. I will also be running a competition to win a box later this week to coincide with my blog birthday celebrations. 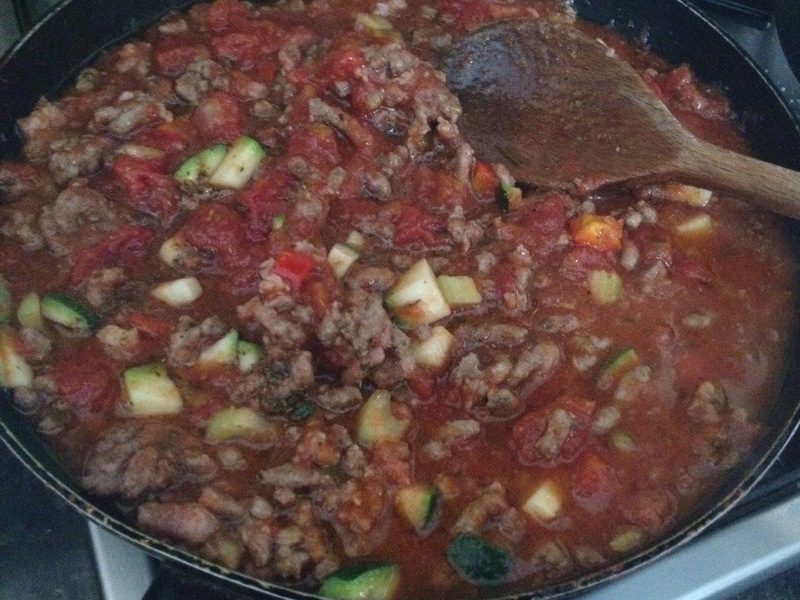 Brown your mince and bacon before adding your diced courgette, peppers, garlic paste, dried herbs and celery. 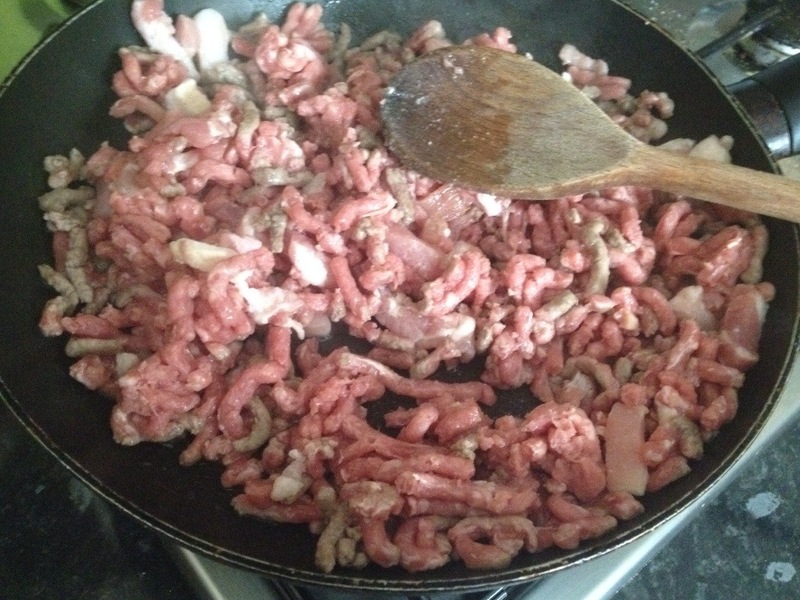 Lightly sauté for a few mins before adding your Organico sauce and chopped tomatoes and stir through, leave to simmer. Make up your white sauce – melt butter in a sauce pan, beat in your flour and then whisk in your milk and simmer until thickened, season with salt and pepper and mix in about 50g of cheese. 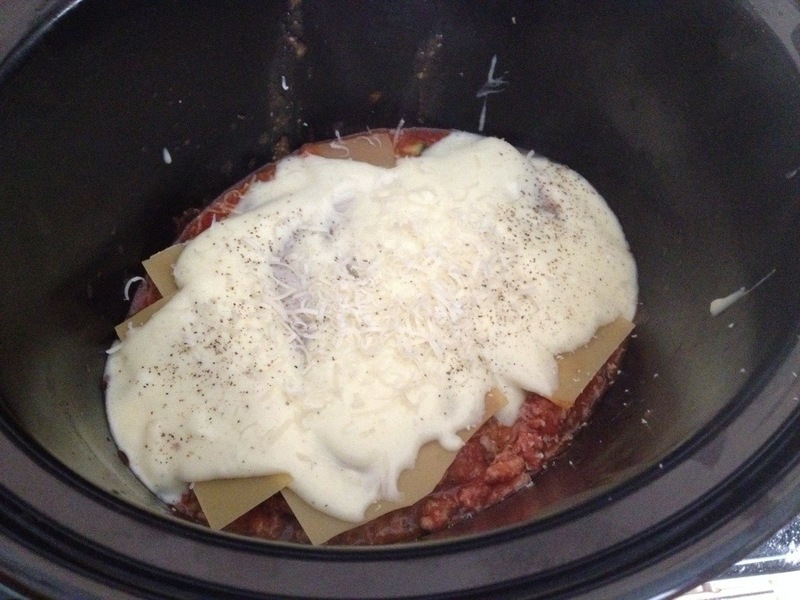 Turn off the heat on your pans and put your first layer of bolognese sauce into the slow cooker and turn on to high. Add a layer of lasagne sheets and then white sauce ( sprinkle with some remaining cheese) and continue until you run out. For the final later top your white sauce with creme fraiche, grated Parmesan and black pepper then decorate with sliced tomatoes and basil leaves. Drizzle with olive oil and put your lid on. Leave for 5-6 hours until golden. 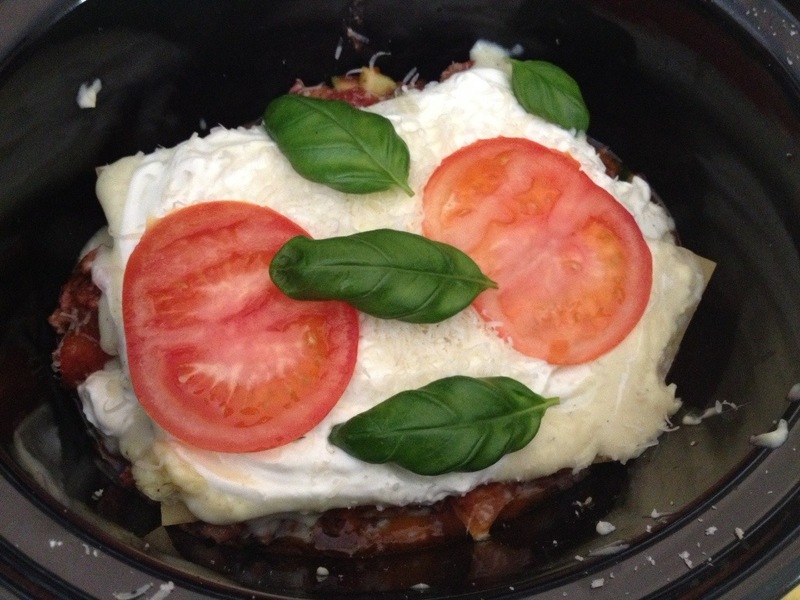 This method would work with your usual lasagne recipe but this one was particularly good. Tomatoey, cheesy, basilly goodness. I must be the only person I know who has really been looking forward to the autumnal weather. Normally I am such a sunshine girl but pregnancy and the heat we have had this summer don’t really mix very well so now that the temperature is dropping I couldn’t be more thrilled! Warm socks, candles, crumbles and stews feature on my to do/wear list this week and I’m pretty excited about it. 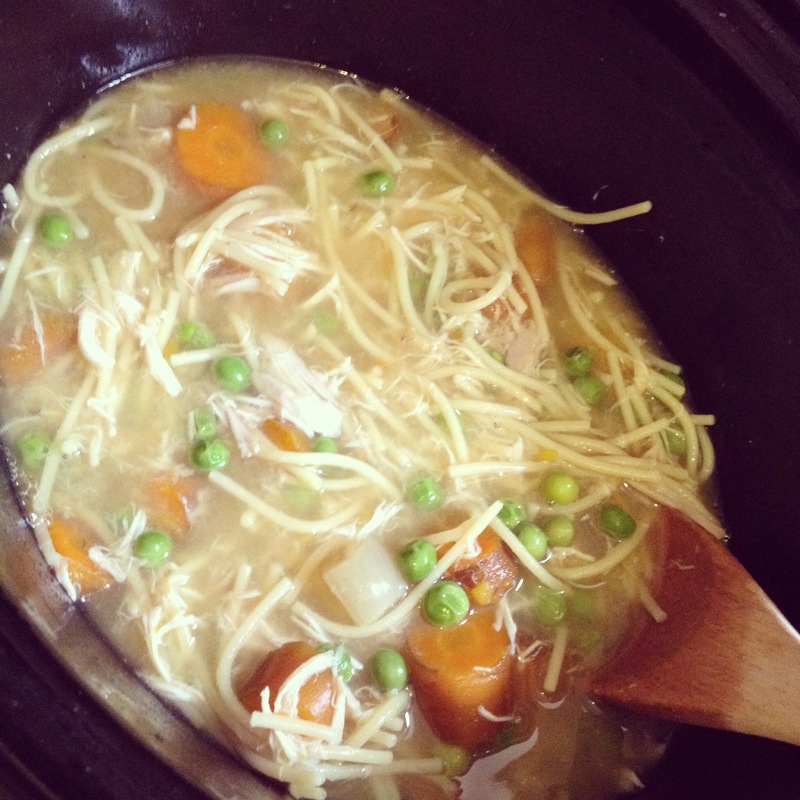 I use my slow cooker LOADS more when its cold. 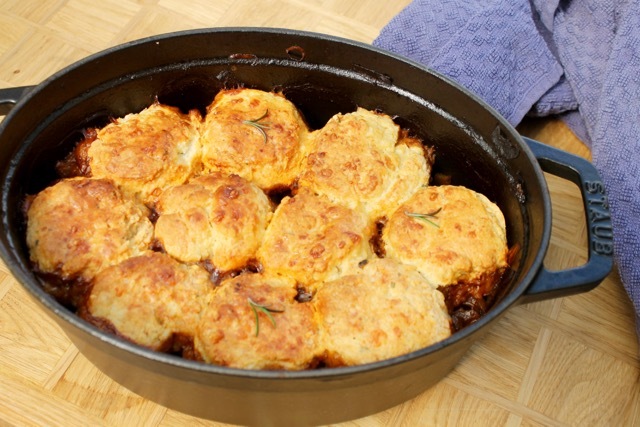 I love casseroles, stews, soups and slow cooked joints of meat served with hunks of homemade bread or creamy mash. My meals are cheaper as I throw all my last bits of vegetable into everything, I use cheaper cuts of meat and it saves me a lot of time too. Lately I haven’t had the same energy and enthusiasm for cooking as I’ve been so worn out and slow cooking is ideal for when I feel this way. You really can throw meat, veg and some stock into the pot..leave it untouched for 5 hours and somehow arrive home to a tasty meal. It’s magic I tell you. Sometimes a (very) little bit more of an effort is required and can make a really special meal. Today I decided to fiddle about with some spicy sausages, leftover veg and some tinned bits n bobs and woweee it worked well. 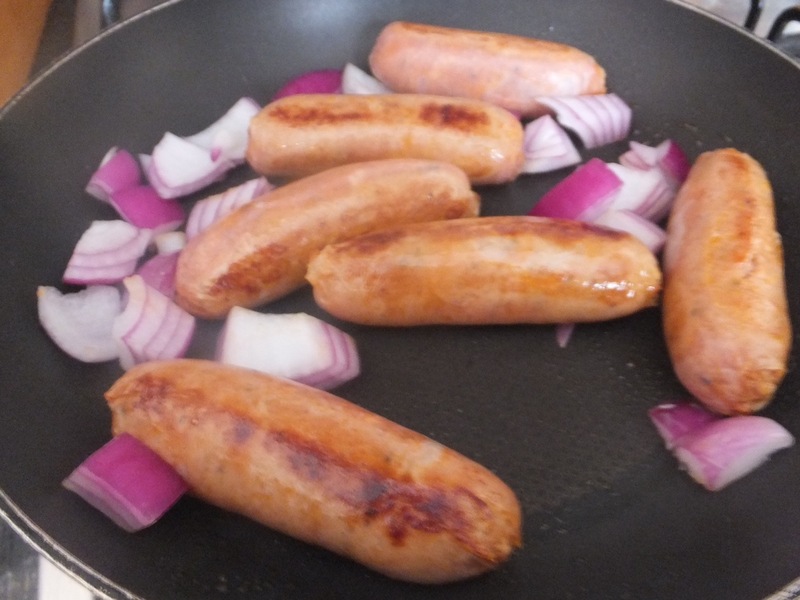 Brown your sausages and onions over a moderate heat in a dry frying pan before placing in slow cooker with the rest of your ingredients and stir well. Place lid on top and turn on high for 4-5 hours or low for 6-8. 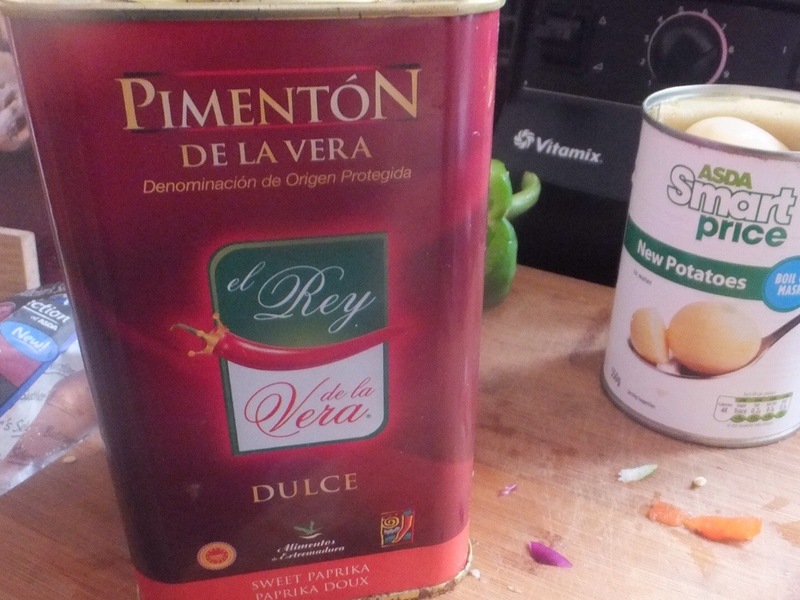 I served mine with herby parmentier potatoes.. You can find the method to make these here simply replace the fajita seasoning with garlic and dried or fresh herbs as well as olive oil. 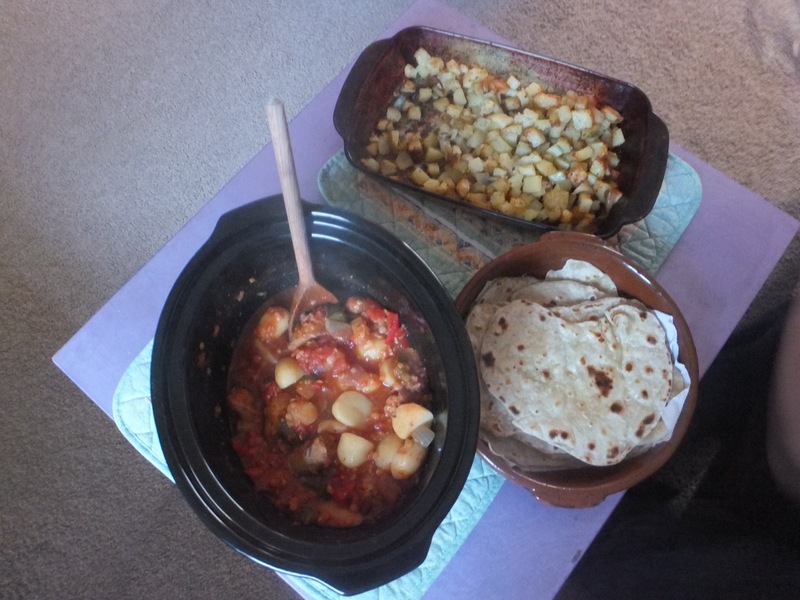 I also served homemade flatbreads which were perfect for mopping up the sauce. You could easily just serve this with crusty bread and it would still be a substantial meal. I try to have at least one day a week which has meals which are not meat based. Not only does it save money but it makes a nice change and as long as it doesn’t happen too often nobody moans. 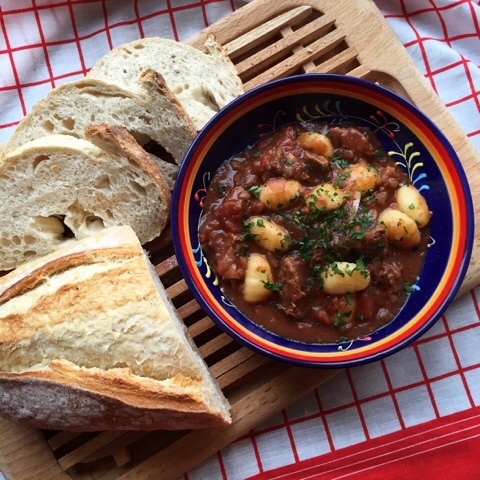 This recipe was created by throwing a few ingredients in the slow cooker (at the end of the month when I really needed to go shopping) whilst hoping for the best and it turned out so well I will definitely make it again. 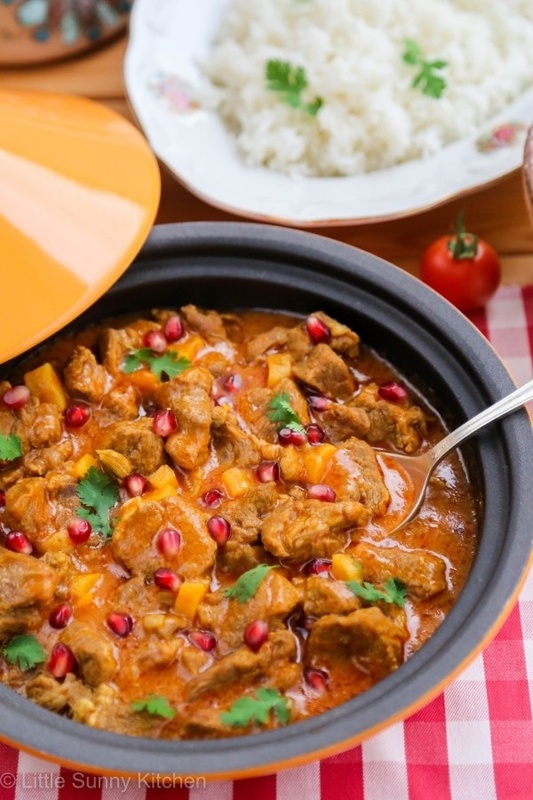 Turn your slow cooker onto high and tip in your coconut milk,stock and curry paste while you get the rest of your ingredients ready. Tip in your potatoes, chickpeas and broccoli along with any seasoning you wish to add and give a quick stir and leave to cook on high for approx 4-5 hours. 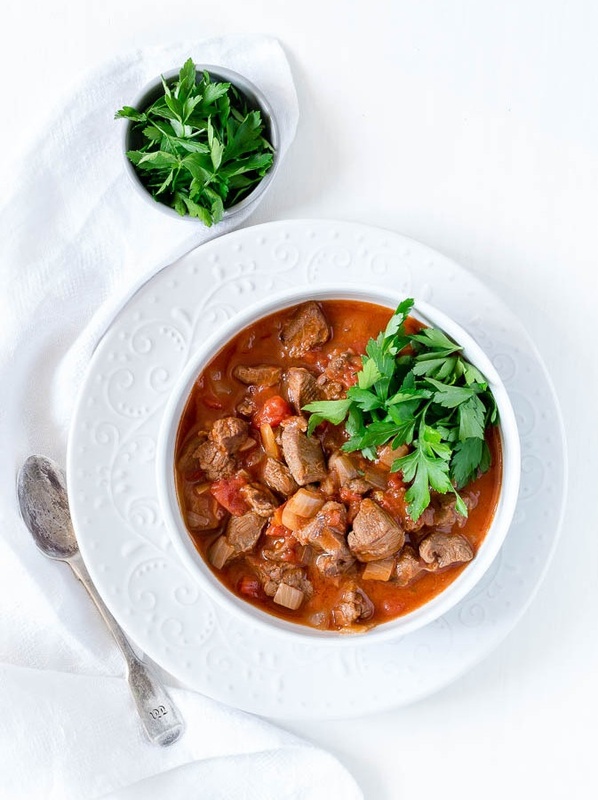 You could add any vegetables you had hanging around the house or lurking in your fridge or use butter beans instead of chickpeas. I served with rice and flatbreads. This had just the right fiery kick for me but if you are a little braver you could definitely add more chilli paste or chop a fresh chilli in. 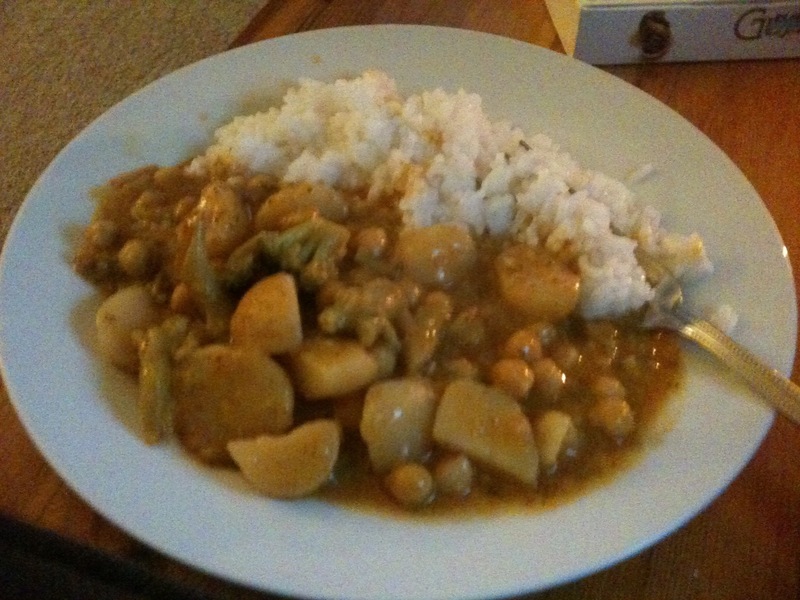 Also at the end it was a little too thin for my liking so I added a paste made with cornflour to thicken. A super simple meal for those evenings when you are feeling a bit lazy but what a home cooked meal. Fed 2 hungry adults ( 1 pregnant) and there were leftovers for the next days lunch. *Tip – don’t turn your nose up at tinned potatoes. I always have a few in my cupboard for emergencies ( when I forget to go shopping) and they are great in stews, curries or sautéed.